A former cardiology nurse has been appointed as the Rector of Quinton, Welford, Weston and Marston Sicca in the North Cotswolds. The Revd Rosalyn (Ros) Greenhalgh spent 30 years of her life working for the NHS, before she felt called to ordination eight years ago. In her post as Senior Sister of the Cardiology Unit at Gloucester Royal Hospital, she was responsible for the day to day management of a staff of 70 and a busy 40 bed unit. 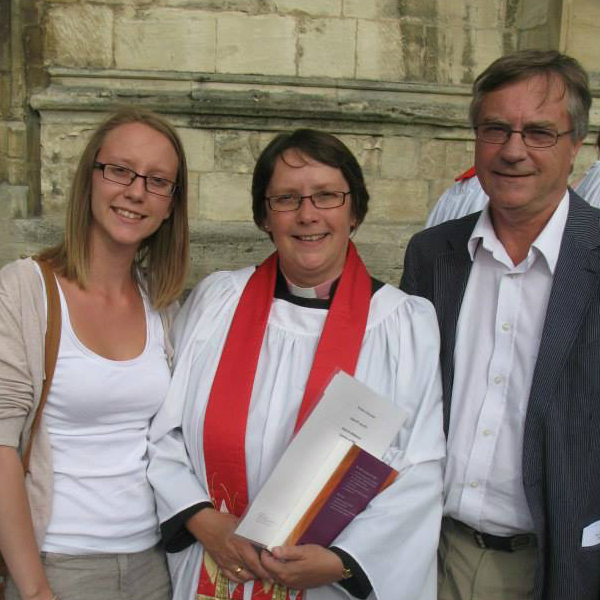 She has been serving as a curate in the West Cheltenham Team Ministry for the past three years. Ros is married to Tim and they have a daughter called Sarah who is a primary school teacher in the Forest of Dean (shown in the picture). They also have a cocker spaniel called Tobermory (Toby) who is named after one of their favourite places in Scotland. They love to travel and both play musical instruments. Ros said, “Tim and I are really looking forward to moving to South Warwickshire and are very excited at what God has in store for us on this next step of our journey. We will be living in Welford but can assure you that we'll be proactive in getting to know everyone across the Benefice. If you see us out and about then do stop and introduce yourselves to us and be assured that the kettle will always be on at the Rectory if you're passing. Ros will be licensed on Sunday 21 February at 3pm in St Swithin’s Church, Quinton.